When you were growing up, did you spend hours with your nose in a book? Do you love the feel of fresh paper, the smell of old books, and the familiarity of a pen in your hand? Do you love brainstorming new ideas and creative solutions? Do you have an affinity for the written word? If so, you may be an ideal candidate for Buffalo State College’s English Program. An English degree can open the door to many rich opportunities. Lawyers, professors, researchers, and lawmakers all need to have a heightened awareness of the power of language. Writers are needed in the fields of marketing and advertising, writing ad copy and other content. Finally, a writer’s precision, persuasiveness, and ability to communicate clearly and effectively can serve you well in a wide variety of fields. Tim Bryant, associate professor of English, believes play can contribute to learning. For instance, in his American novel course, he challenges students to make metaphoric links in Mark Danielewski’s experimental novel House of Leaves while also playing the block-stacking game Jenga. "I was blessed with exceptional professors who taught the great literary works from positions both analytical and creative, the importance of multiculturalism in the arts, the fundamental rules of storytelling and, later, how to break those rules to shape my own work," said Kyle Bradstreet, '02, '04, who is a writer and supervising producer for the USA Network series Mr. Robot. The show took home the “Best Drama Series” award in 2016. Buffalo State English bachelor’s degree program builds understanding of the development of literature in English and an appreciation of the variety and richness of literary texts. Courses emphasize interpretive thinking and precise written and oral expression, and the practices of reading, writing, and critical analysis. Students become adept at arguing a point, framing a narrative and analyzing various levels of meaning. This helps them develop research and critical thinking skills that are an excellent preparation for many professional fields, including teaching, journalism, law, publishing, medicine, and business. Stellar faculty: Our faculty members have published countless books and articles in their fields, and present regularly at national and international conferences. Small class size: Because most classes for English majors have about 20 students, students receive plenty of individualized attention. Student literature magazine: Student can participate in literary and arts journal that has been produced by Buffalo State students since 1948. Minor options: Several minors complement the English major, including African-American Studies, Women and Gender Studies, Theater, Legal Studies, Philosophy, and Film Studies. Sigma Tau Delta: Sigma Tau Delta is the International English Honor Society. 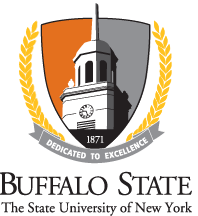 The Alpha Pi Chi Chapter at Buffalo State College was founded in 2009 and recognizes excellence in scholarship, leadership, and service for undergraduate and graduate students. Summer in Istanbul Program: Through this interdisciplinary study tour explores the ethnic and cultural diversity of Istanbul, Turkey, students study Turkish literature, autobiography, and memoir during a summer trip. Elm Leaves Journal: Buffalo State's historic literary and arts journal that has been administered, edited and produced by Buffalo State College students since 1948. Tha Ink Club: This organization promotes freedom of expression, social and political awareness, through service, poetry, and spoken word, but mainly focusing on the verbal art form of poetry.